6 Lobe Torx drive recess with an internal pin to resist tampering. Stock available in 410 Stainless and Galvanised steel, other materials by special order. 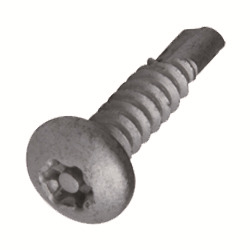 Self drilling point for efficient installation into steel, no pre-drilling required.